great way to go when you want to change the appearance and performance of your bathroom is to install a high quality, wallmount showerhead system. A good choice would be 5 Function Luxury 4” Handheld Shower Head System by A-Flow™. It is armed with important features and specifications that make it a great performer that will enhance the interior décor of your bathroom and deliver a refreshing and rejuvenating showering experience. Its three-way dual head shower allows you to enjoy both showers at equal pressure at a time or either of the showers differently. 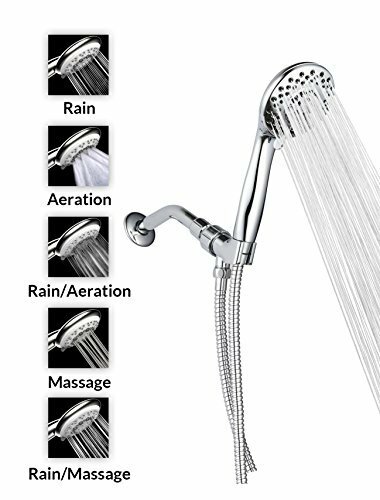 There are many other features you will only recognize and possibly appreciate by going ahead and purchasing this showerhead. All you need to do is simply turn diverter switch to direct water flow and then turn the dial to choose your desired showering setting. The showerheads are 4-inches in diameter, which is large, and the entire unit is made with durable ABS material with chrome plated finish. It comes with 60” flexible hose also made of durable ABS material. When it comes to appearance, the showerhead is simple elegant. The chrome plated finish gives a mirror-like pattern, which greatly accentuates the interior décor of your bathroom. The design alone makes A-Flow™ 5 Function Luxury System number one choice for home remodeling or new installations. This unit comes with universal parts. This means it can work with all standard plumbing. Installation is simple, easy and straightforward. You do not need any tools or special knowledge to do it. The package comes with free thread sealant tape that will minimize any chances of leaking after successful installation. First, it gives your bathroom a very luxurious look. Second, you get to enjoy the flexibility of its hose that can allow you adequate distance and movement while in the shower. Third, it is very easy to install and you won’t need any tools for the installation process. Fourth, all its components are universal, and therefore, it will be compatible with your plumbing system. All the components of this handheld showerhead are universal meaning they are compatible with all standard plumbing. Has a 5-functional setting for showering patterns allowing you to enjoy soothing, relaxing and invigorating experience. The luxury design means it will enhance the interior décor of your bathroom giving it a contemporary style. It is extremely easy, quick and straightforward to install. You need no tools for the job. Since it is made of plastic, this showerhead may not be as durable as depicted by the manufacturer. The aeration function is present but it is not as good as described in the user manual. You will not regret purchasing the A-Flow™ 5 Function Luxury 4” Handheld Shower Head System. It is designed to deliver great showering experience and to enhance the interior décor of your bathroom. The showerhead is very easy to install. It conserves water and very affordable. Although made of plastic, it can serve you for good time if you install it successfully and use it as recommended. Next How to change the diverter on a shower head?